GET AT LEAST 10,000 GOLD! MAX 1,000 DIAMONDS! - Draw a Jackpot Box in event period, Get at least 10,000 gold! And More Special Rewards: 1,000 Diamonds! Premium Pack (+30)! These are waiting for you!!! - 50% Discount For Draw Jackpot. - Just LOGIN! Get FREE 20 MILEAGES every day! - GET Mileage More and More! 5 keys = 1 Jackpot Box key! SEND A CLOVER MORE! GET A JACKPOT MORE! DAPATKAN MINIMAL 10,000 GOLD! MAX 1,000 DIAMONDS! 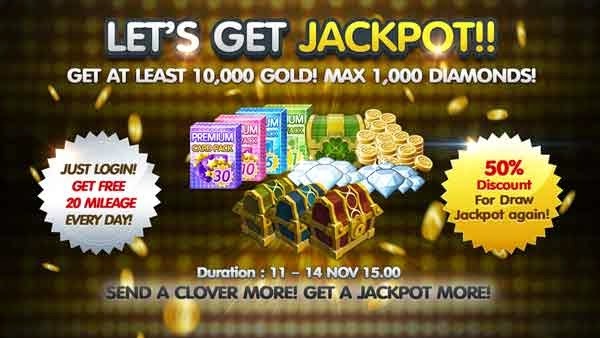 - Buka Jackpot Box ketika event berlangsung, Dapatkan minimal 10,000 gold! Dan juga HADIAH SPESIAL lainnya: 1,000 Diamonds! Premium Pack (+30)! menunggumu!! - Cukup LOGIN! Dapatkan 20 MILEAGES GRATIS setiap hari! - Dapatkan Mileage Lagi dan Lagi! 5 kunci = 1 kunci Jackpot Box! KIRIM CLOVER YANG BANYAK! DAPATKAN JACKPOT TERUS! รับขั้นต่ำ 10,000 ทอง! สูงสุด 1,000 เพชร!